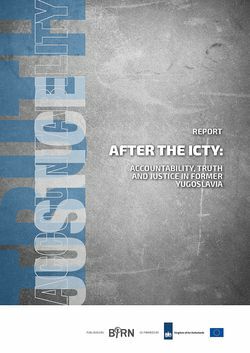 The Balkan Investigative Reporting Network (BIRN) has published its report entitled After the ICTY: Accountability, Truth and Justice in the former Yugoslavia, which gives an overview on the current status of regional cooperation on missing persons, prosecution of war crimes, and victims’ participation in transitional justice mechanisms, as well as the role of archives, art, media, and museums in the memory work related to the 1992-1995 Yugoslav Wars. The report is the outcome of a conference organized in Sarajevo in October 2018, and Blinken OSA was invited to participate in the archival panel as an expert of records dealing with the history of these wars and with the atrocities committed during these years. During the debates, Blinken OSA’s position was that institutional (ICTY and domestic courts), nongovernmental and community or private archiving efforts should be better coordinated; records preserved by these institutions should be made as largely and easily available as possible to all constituencies, especially to victims’ families and survivors; there should be a more meaningful cooperation between local and international archives professionals dealing with such specific documentation; and only a fact-based, alternative narratives building on relevant archival sources can counter dominant ethno-nationalist discourses on the conflicted, common past in the region.